Bonus: Which New Car Keeps Hurting Your Eyes? We had so much fun reading your responses to yesterday's QOTD that we would be remiss not to offer a follow up. To wit: I have tried and I have tried but no matter how hard I stare I just cannot find a decent angle on the E92 3-Series. 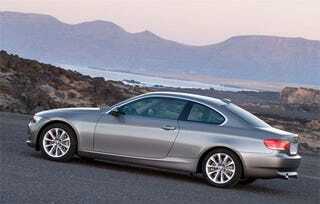 It's as if BMW took one of Chris Bangle's designs and tried to reform it into something that could pass for a Honda. The front end looks after market, the proportions are wrong (the door on the coupe appears to be longer than the hood!) and the malformed rear end looks to be from Tokyo, not the Black Forrest. And you know what might be worse? The BMW X3. Straight up ick. You? Which New Car Keeps Catching Your Eye?